IDE and SATA are different types of interfaces to connect storage devices (like hard drives) to a computer's system bus. SATA stands for Serial Advanced Technology Attachment (or Serial ATA) and IDE is also called Parallel ATA or PATA. SATA is the newer standard and SATA drives are faster than PATA (IDE) drives. For many years ATA provided the most common and the least expensive interface for this application. But by the beginning of 2007, SATA had largely replaced IDE in all new systems. The ATA interface (ATA stands for AT attachment where "AT" refers to IBM's PC/AT for which it was originally built) evolved in stages from Western Digital's original Integrated Drive Electronics (IDE) interface. After the introduction of Serial ATA in 2003, the original ATA was retroactively renamed Parallel ATA. Maximum compatibility Inexpensive, large storage capacity. Lacks support for new technology such as native command queuing and hot-plugging hard drives Lower MTBF than SAS (700,000 hours to 1.2 million hours of use at 25 °C), less suited for servers. Ribbon-like, wide, can be up to 18 inches long Narrow, can be up to a meter (roughly 3ft) long. Power and data split into two connections. In a computer system, it's possible to have more than one harddrive. To connect multiple IDE drives, you need to chain the ribbon cables from one to the next. The computer system has no idea which is the main drive, from which to load the OS. SATA drives don't use jumpers. Each drive connects directly to the motherboard. To set the primary drive, you can access the settings from the computers BIOS (special software that runs when you start the computer). 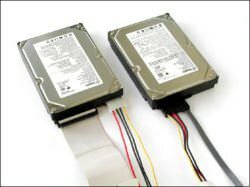 Hard drives need a cable/connection for data and one for power. Parallel ATA only allows data cable lengths up to 18 in (457 mm) while SATA allows cable lengths up to 1 m (3.28 ft). eSATA cables can be 2 m in length. IDE consists of a 40-pin connector attached to a ribbon cable. 80-pin connectors were also introduced later. The connectors are black in a 40-pin connector while in an 80-pin connector, they come in 3 colors: blue - controller, gray - slave drive, and black - master drive. Each cable has two or three connectors, one connector is attached to the interface that connects to the computer system (mother board) and the others are connected to the drives. SATA consists of an 8 mm wide wafer connector on each end and the cable has a 7-pin connector, 3 grounds and 4 active data lines in two pairs. It has the facility to attach only one drive and so Serial ATA does away with Master/Slave configurations. This video explains how to change the hard drive on a desktop computer; it also shows the differences between SATA and IDE connector cables. You can buy integrated motherboards that allow a computer to use both SATA and IDE hard drives. However, only one of the two may be used at any given time and both cannot be used simultaneously. Adapters are also available that allow an IDE drive to be used with a SATA motherboard and vice versa. 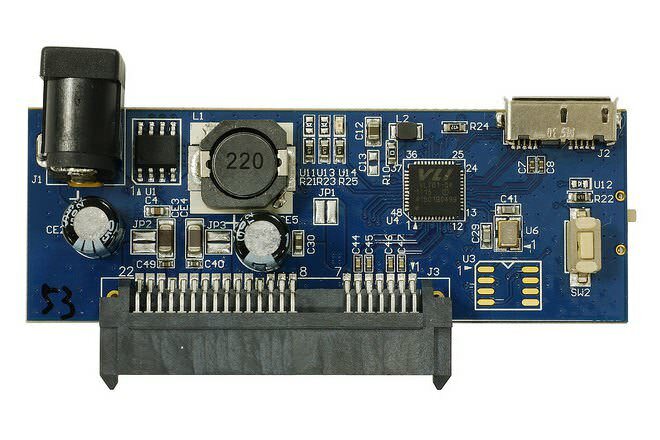 These IDE/SATA adapters mask the underlying hard drive and simulate its functioning to match the expectations of the computer's motherboard. They usually cost less than $15. Two variant of SATA - eSATA and eSATAp - are available. eSATA is meant for external connectivity. eSATA cannot supply power from the motherboard to the hard drive. In order to overcome this limitation, eSATAp drives were introduced. eSATAp port combines the strength of both eSATA (high speed) and USB (compatibility) into a single port. Data transfer speed for IDE ranges from 5MB/s up to 133MB/s (ATA100/133). The parallel wire transfer mode reached its limit with the speed of 133 MB/s. SATA took off where ATA stopped as far as speed is concerned. The first generation of SATA was 1.2 Gbit/s (150 MB/s; note that MB is megabytes and Gb is gigabits) similar to PATA/133. 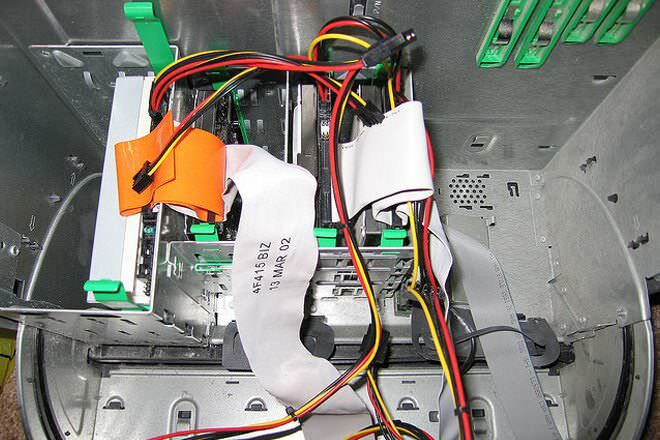 Today the third generation of SATA (3.0) (released on May 27, 2009), 6 Gbit/s (600 MB/s) hard drives and motherboards are being used. The wide wire in IDE cables caused airflow problems inside the case. The narrower SATA cable allows free airflow inside the case. SATA drives have an additional feature of Hot plugging which mean that even as the computer is running drives can be removed or added. PATA (IDE) drives need 5 volts and 12 volts in desktop form factor. but nearly all current disk drives do not use the 3.3 V line. SATA has also done away with the master/slave configuration (technically, device 0 and device 1) used in IDE drives. With PATA (IDE), attaching two hard disks to the same channel required one to be set to be the master, the other the slave. For hardware, this usually meant setting the right jumper settings. But the SATA bus is a serial point-to-point bus, which means only one device can be connected on each channel. Many SATA drives can connect to the motherboard via multiple ports, and the drive to boot from is specified in the BIOS settings. very good information and in a simple language.